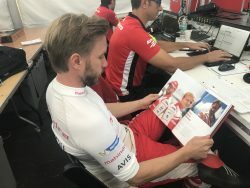 Written and designed from scratch, with bespoke interviews and features, the book was created in a three-week time frame from the team’s victory at the Berlin ePrix to the NYC event. Tight turnaround required efficiency and accuracy of work to get hundreds of printed books to New York from the UK. Team personnel and sponsors received a copy of the book, which perfectly captured the team’s success and positioned Mahindra Racing as the breakthrough of the season.